With its mega-size LED playfield, dynamic cabinet lighting and pulse-pounding sound effects, our Mega Stacker game demands attention and is a great signature piece for any game room. Mega Stacker is simple to learn and fun to play. The player uses the start/stop button to stop moving LED blocks in order to “stack” them on top of the previous level. With each higher level the game gets progressively harder. Once the player reaches the Ticket Level, they can collect the Ticket payout or continue to play on for a Major Prize. If they gamble on the Major Prize and lose, they’ll only get the designated ticket reward if the Mercy Prize option has been activated. Still a top earner, Mega Stacker has been on the RePlay Magazine Players’ Choice Poll for 70 months, much of that time in the #1 spot for Best Merchandisers. Your prize doors are like billboards for your game. They can be the make-or-break factor in whether a customer stops to play or walks on by. These are big, bright, showcase displays, and yet too often we see operators not taking advantage of this opportunity. Placing a small single prize in these slots doesn’t demand attention and create excitement. We suggest dressing it up a little, like a point-of-purchase type display. For instance, if your prize is a Nintendo 3DS, put some Nintendo signage around the prize compartment, include a Mario plush, maybe a 3DS game, and a case. Savvy operators will use these windows as a mini-redemption counter, filling them with the most coveted prizes and advertising how many tickets or credits are needed to win each prize. We also recommend updating your displays regularly to keep your customers excited. The more often you change your prize doors, the more people will look at your game and want to give it a try! 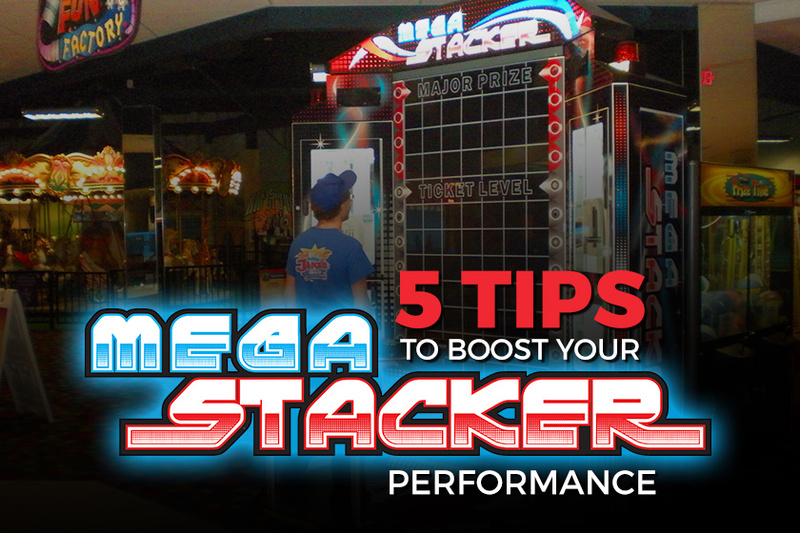 When picking items for your Mega Stacker game, we recommend using different types in each of the 5 Prize doors to determine which prizes are most desired by the players. You can then use the game audits to check popularity and vary the stock accordingly. A general understanding of the basic demographics of your location and the likes and dislikes of your customers will allow you to improve the merchandise selection and increase the revenue that your Mega Stacker is generating. Experiment with higher price per play and higher value prizes in this attraction piece – While you need to make the ultimate decision for what works best in your venue, we’ve had many operators reports their Mega Stackers are earning $3 per play! Make sure that the players know that they can and do win. Provide the location manager or someone reliable from your staff with a camera and instructions to photograph Major Prize Winners and then post the photo’s inside the game cabinet. In many cases, this has proven to DOUBLE Stacker revenue! Regularly dust and clean the external cabinet areas using a soft water-damp cloth and mild soap. Any scratches or marks in the glass or acrylic can be buffed out using car polish or cut and polish. Regularly check that all the Display and Button Lamps are working correctly through the Sounds, Lamps and Display Test. Stay on top and replace any globes or buttons that are not functioning properly. It’s always a good idea to keep a few extra control panel buttons on-hand to make sure your Mega Stacker game doesn’t miss a chance to earn you revenue. Downloadable brochures, manuals and files for your game room planning can be found here.